Let’s talk about something other than my dental angst, shall we? Oh yes, do let’s. I love the color pattern. I love the look of the seed stitch. Construction-wise, this was a fairly easy knit. Classic neck-down construction, with the sleeves picked up and knit straight from the body in the round. I like that on baby sweaters – it’s a small thing, but I like not having a seam down the arms. Seams can rub, even when you’re using soft yarns. No seam, no chafed baby arms. Good deal. But I don’t know I if I’m actually going to make the other two on the list to this same pattern. The seed stitch got very tedious after a while, and frankly…well, I like the ‘clean lines’ look of this, but suddenly I have a wild hankering for more color. We’ll see if it passes…if not, I’ll come up with a Plan (Pattern?) B for the twins. Now, this little darling is pure pleasure to knit. The pattern is just interesting enough to keep me awake (even though I slept like @*^& last night and feel rather droopy today), but not so interesting that I can’t find my place when Captain Adventure pulls my post-it note placeholders off the pattern. This one involves steeks. 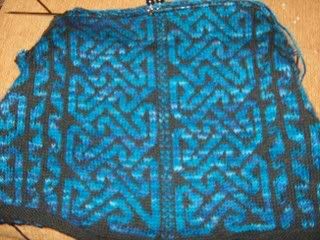 That funny non-cable down the front is the front steek – I’ll be cutting that right up the middle to make it a ‘vest’ rather than a ‘sleeveless sweater’. There are also steeks for each arm, and in about four hours (or so) I’ll be putting in neck steeks as well. The neck steeks make me happy. They mean that, instead of going to ‘flat’ knitting (knit across, purl back), I can continue in the round. While I wouldn’t say that purling is my sworn enemy or anything the way some knitters do…it’s not my favorite, either. I find that my hands tire more quickly with purling, and when I’m doing color work it becomes a pain in the tookus. I have trouble seeing what color ought to go where and then when I’m knitting back, I’m constantly having to drop-n-fix stitches (this is where you intentionally drop a stitch which is the wrong color, and pick the stitch back up with the correct color from the strand – another great reason to make sure you strand loosely across the back of your work!). You know what else would make me happy? Pizza. Pizza sounds really, really good right now. Hmm. I wonder if I have any cash to pay for a delivery...because see, not only does pizza sound good, it also sounds like ‘not cooking’, which sounds like ‘not getting out of my chair more than absolutely necessary’ which sounds not just good, but great. Oh, you poor woman! There's nothing quite like dental trauma. I have managed in my lifetime to have a wisdom tooth removed 2 days before Thanksgiving...twice. I was also hit in the mouth with a baseball bat 2 days before high school graduation, and have spent the following 39 years dealing with dying roots, root canals, apicoectomies, etc., ad nauseum. Now it appears to be moving to old crowns. "Long in the tooth"-who knew? I love your blog and read it regularly. I'll let you know when mine's up. The vest looks great, however. Pizza is the world's most perfect food. Trust me. I hope your mouth feels better soon. 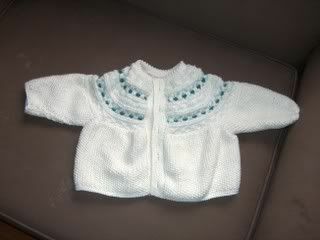 Quick idea re the baby sweater - how about ignoring the bit which tells you to seed stitch for miles and just stocking stitch it? You can put an inch band of seed stitch at the bottom to act as a hem. Hope the mouth feels better soon.